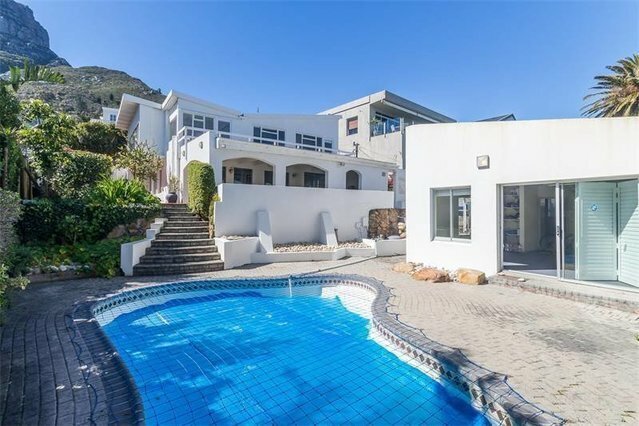 Between palms, soaring mountains and the ocean this charming beach house in the sun exudes the character of bygone Llandudno. Most of the spaces in the house are well proportioned and boast a light and bright ambience. The upstairs especially is super light and charming with a generous landing and three large bedrooms and one smaller one - ideal as a nursery.. All three front facing bedrooms flow out onto a balcony running the length of the house and the master bedroom enjoys wonderful north light and views through a wall of windows. Two bathrooms service the upstairs, one is en suite. The master bedroom is super large with very adequate space for a sitting area. The addition of an en suite bathroom in this generous space could be planned if desired. Downstairs the lounge is a lovely, inviting room enhanced by the fireplace. It too enjoys north light through its side window and extends into a dining area with easy access to the kitchen alongside. Additionally, off the entrance hall, there is another large livingroom. Opening the kitchen to this area could also be arranged to create a more modern and open-plan design. There is a cozy study on this level and third bathroom. An all-weather, under-cover, deep verandah flows off this area and provides all year round entertaining and easy access to the pool below. The separate studio situated alongside the pool is a bonus and offers all sorts of opportunities. Fitted with bathroom and space for a kitchen it could easily become a lovely apartment for visitors / work-from-home situation or conversion to an indoor entertainment area on the pool level. Garaging on the driveway provides secure space for two cars as well as very adequate space on the drive to accommodate more vehicles off the street. Easy walking access to the beach, sports club and Llandudno Junior School.The options to upgrade this property are plentiful whilst still retaining the original charming design and flow of the house. Alternatively, redevelopment in line with other Llandudno homes might be considered to take fully advantage of its position in this sought-after suburb.